The world’s six largest pension systems will have a joint shortfall of $224 trillion by 2050, imperiling the incomes of future generations and setting the industrialized world up for the biggest pension crisis in history. This is one of the main findings of the new World Economic Forum report, We’ll Live to 100 – How Can We Afford It? , which shows how the global pension shortfall will soon dwarf global GDP. To alleviate the looming crisis, governments must address the gaps in access to the pensions system and ageing populations as they are the key sources of the widening pension gap. Meanwhile, the report also found that millions of future workers may have to wait until they are well into their seventies before they can retire, as countries around the world face a race against time to plug a pensions funding black hole. As the quality of healthcare has increased during the past century, so too have global life expectancies - but new generations will pay a high price for living longer. Longevity has been steadily increasing since the mid 20th Century, with the World Economic Forum report finding that babies born in 2017 can expect to live 100 years or more. The report calculates the impact of ageing populations on the pension gap in the world’s largest pension markets, which include the United States, United Kingdom, Japan, Netherlands, Canada and Australia. The gap in those markets is the largest in the US, where a current shortfall of $28 trillion is projected to rise to $137 trillion in 2050. The average gap in the six markets combined is calculated to reach $300,000 per person. 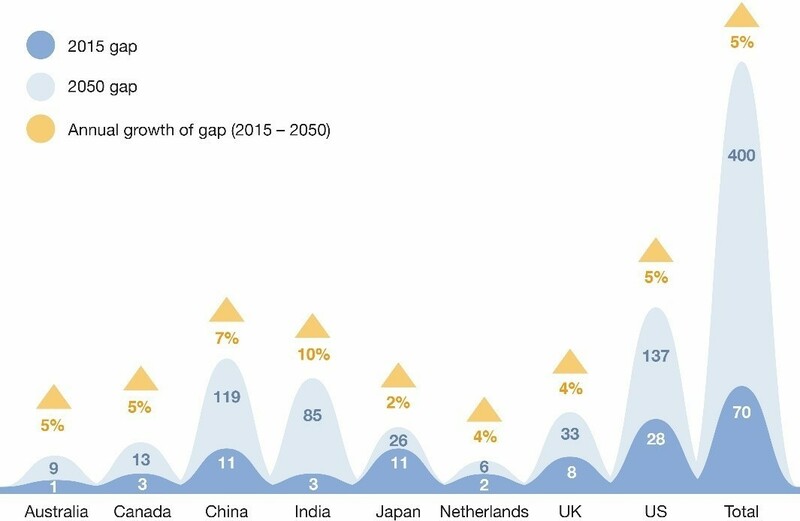 The total gap for all eight markets in the study (which further includes China and India, which have the world’s largest populations) will reach a total of $400 trillion by 2050. The rough target for most retired people around the world is to have a pension equal to around 70% of their pre-retirement income. This will provide them with a similar standard of living, as outgoings such as personal savings and tax are often reduced in retirement. However, for low-income earners the 70% target will not be sufficient and could result in poverty unless savings are increased. According to the report, an ageing population will continue to drive a pensions funding gap that will grow at a rate higher than the expected economic growth rate, often 4%-5% a year. Fortunately all is not lost - there are actions governments and other policy-makers can take to reinforce creaking pension systems.